Support Letter from Paul Berg, Former BIA Employee at Pine Ridge. Mary Robinson, the United Nations High Commissioner for Human Rights has written to the President to urge clemency. Statement of Congresswoman Maxine Waters Urging President Clinton to Grant Executive Clemency to Leonard Peltier. Standing from L: Irene Harris, Exec. 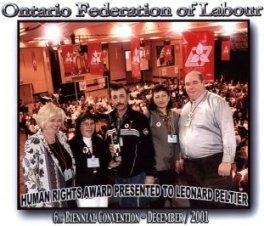 VP, OFL; Ethel Birkett-LaValley, Sec.-Treasurer, OFL; Frank Dreaver, Anne Dreaver, LPDC Canada (Coalition); Wayne Samuelson, OFL President. Affidavit from private investigator, Eda Gordon stating that interviews with trial witnesses confirmed FBI coercion. "Appeal for the Release of Leonard Peltier," Released by Amnesty International U.S.A. Statement by Congressman Joe Kennedy: "...problems found with the evidence are grounds for a new trial." Gerald Heaney was one of Peltier's appeal judges who later wrote this letter expressing his concern over the standing conviction. This is Judge Heaney's October 2000 letter affirming his position stated in his previous letter. Letter to Attorney General Janet Reno from Senators Wellstone, Inouye, Deconcini and Campbell requesting an Evidentiary Hearing to examine the serious claims of government misconduct surrounding Peltier's trial. Letter of Request to Attorney General Janet Reno from 18 Congressional Representatives to "order a thorough, independent review of [Peltier's] case, the allegations of misconduct on the part of the federal government, and the Justice Department's role in the pursuit of this case." Lac Courte Oreilles Governing Board of Lake Superior Chippewa Indians: Letter to President Clinton, attached to "Resolution to Support Executive Clemency for Leonard Peltier"